CXC myVAULT is the safe and secure place for all your financial information. Imagine having your exact financial position at your fingertips. Imagine building your own team of experts, whose primary task is to keep you focused on your goals and working with you to activate your prosperity. Now, imagine being able to access that team from anywhere at anytime. Simply complete the registration and CXC myVAULT will provide everything from cashflow management to budget tracking, property valuations, tax documentation and estate planning in the one spot. 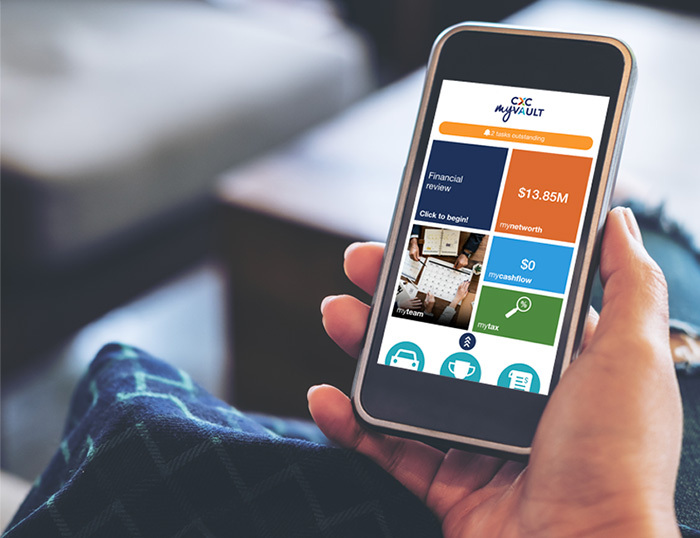 For total mobility, download the CXC myVAULT app, providing 24hr access anywhere and at anytime. Have full visibility over your cashflow. 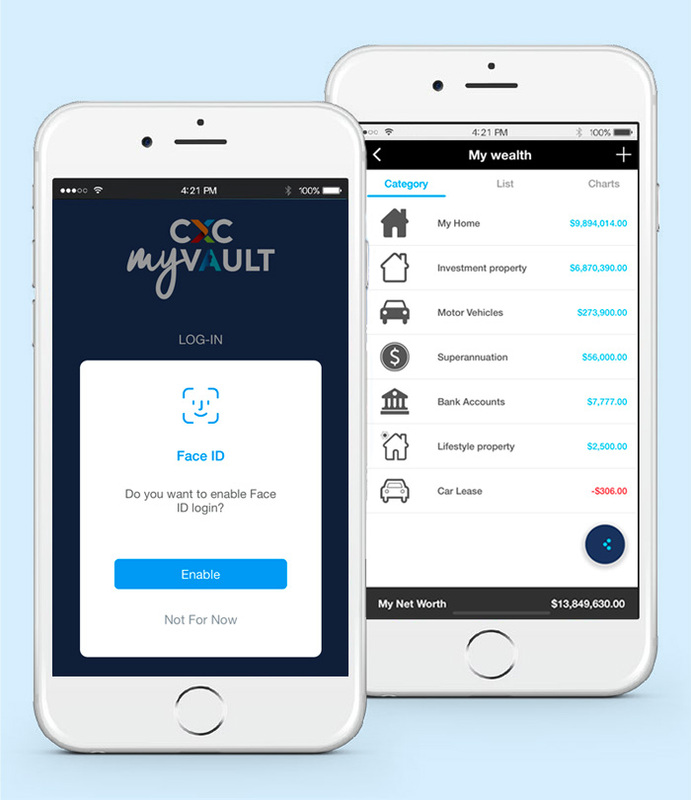 CXC myVAULT will create live data feeds to your financial institutions, pulling in transactional data from your mortgages, bank accounts and credit cards. CXC myVAULT will be your personal balance sheet. When you use CXC myVAULT, you can trust your information is safe. Using 256bit encryption, just like the banks, CXC myVAULT will protect your private details and keep prying eyes away. CXC myVAULT is ‘read only’ which means its purpose is to organise and analyse whilst providing you with visibility and accountability, it doesn’t pay your bills or transfer funds. Know exactly what you are worth. CXC myVault will calculate your actual net wealth, by valuing your assets against your liabilities and putting you in control of your personal prosperity. Budgeting is a breeze with CXC myVAULT. You set your own goals, track your spending and CXC myVAULT will categorise and report on the data automatically. Naturally, if you’d like to re-categorise your transactions you can. From now on you will know exactly where your money is going. Build a team of professionals around you and connect with them on your terms, in your time and when you need them. Our professionals are ready to assist and you can connect with them directly from the App, using the ‘review’ feature. Our team of financial planning, taxation, property and finance professionals will ensure you have all the resources you need and are structured for success. With CXC myVAULT you will succeed. Set the Goals that are important to you, set and obtain To-Do’s and receive automated reminders to ensure you never miss a deadline and always get the documentation to your team. CXC myVAULT will activate your strategy. CXC myVAULT is your safe and secure storage space, leave all your documents in the one place. You can also use digital document signing, on any device, to save time and money. CXC myVAULT is your financial assistant. With CXC myVAULT the power is in your hand to create an immediate impact within your financial world. Visibility, Clarity, Structure and Accountability is what you need to ensure your money works both smarter and harder. CXC myVAULT will be your financial partner.